I once again participated in indoor rock climbing at a venue new to me. It was Edge Adventure in Castlehill and surprisingly decent. It was only $20 for adults, $17 for students and $15 for children. The guys who worked there were wonderful and patient towards me as my fear of heights had again kicked in once I began climbing. I found the training wall to be more of a challenge height wise than the other walls. The only problem I had with this venue was it was a little crowded when it started to get busy and we were all huddled around the same walls. The more advanced you were, the harder the walls became and if you're particularly shorter like me, than it became a little bit more difficult to climb and reach for your next rock once you advanced up. I was struck with disbelief as they also have a long rope ladder climb that you can do. I stood there amazed as one man had to use his whole body weight and height to even get to the next step. 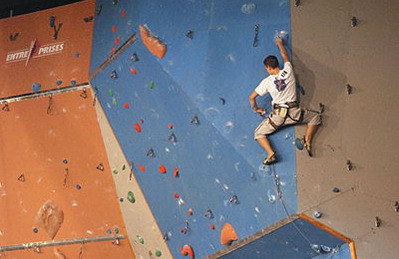 If anyone is up to the thrill of climbing and doesn't have a particularly bad fear of heights like myself, I would definitely recommend this venue as the service, price and range of climbing difficulties was great.